South Sudan Crisis | USAID CIDI is an education organization that is focused on effective public donations in support of disaster relief. In South Sudan, an estimated 7 million people need urgent humanitarian assistance. More than 4 million people have fled their homes since conflict began in December 2013. People continue to flee South Sudan in record numbers as conflict spreads into new areas. Disruptions to local markets, a collapsing economy, and related food insecurity also contribute to the mass internal displacement and population movements currently underway. Compounding these dire circumstances, humanitarian workers have been killed or are missing, harassed, assaulted or expelled from the country. Food and other humanitarian supplies have been looted. Deliberate attacks on the men, women, and children who receive humanitarian assistance continue to worsen an already critical situation. Despite these challenges, USAID and its partners are overcoming significant obstacles and working against all odds to reach those in need. Aid workers are tirelessly working at great personal risk to deliver life-saving assistance to South Sudan’s most vulnerable, using every means possible—including air, river, and road—to reach people who would otherwise be cut off from aid. Humanitarian organizations are providing food, safe drinking water, emergency medical care, critical nutrition, improved hygiene and sanitation, as well as emergency shelter materials and other vital relief supplies to millions in need. If you are considering making a monetary contribution to a relief organization, you can find detailed financial and programmatic information at GiveWell, Charity Navigator, Charity Watch, and the Better Business Bureau. The organizations listed below are experienced and are participating directly in relief efforts in South Sudan. 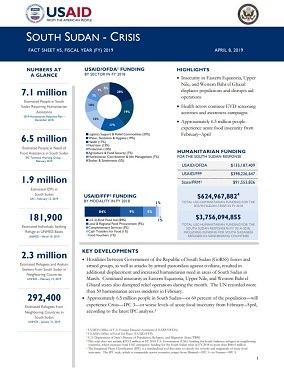 Additional information on humanitarian relief organizations can be found on ReliefWeb, a humanitarian information portal run by the United Nations. 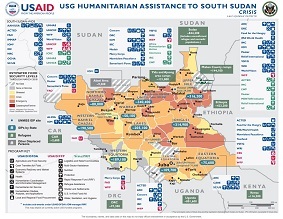 Additional information can be found on USAID/OFDA’s South Sudan web page here.